It’s my mission to try every version I can. Unfortunately, I’ve never found one I didn’t like. 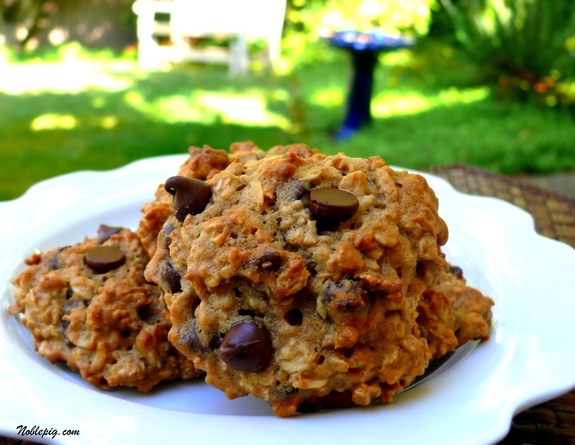 I loved this Banana-Oatmeal Chocolate Chip Cookie. You really taste the banana flavor in the background and the cookie stays really moist. By using banana you are able to add sweetness and flavor while reducing the amount of sugar and butter in a typical chocolate chip cookie. Very nice wouldn’t you say? This is almost health food right? Well, I can pretend anyway. I do think you’ll like them. They passed the husband test so I would say thumbs up for this one. Combine 1/2 cup banana, 1/2 cup brown sugar, 1/4 cup butter, 1/4 cup granulated sugar and 1 teaspoon vanilla extract in a large bowl; beat with a mixer at medium speed until smooth. Add one egg; beat well. Weigh or lightly spoon flour into dry measuring cups; level with a knife. Combine flour, 2 cups oats, 1 teaspoon baking soda and 1/2 teaspoon salt in a medium bowl, stirring with a whisk. Add flour mixture to banana mixture in bowl; beat with a mixer at medium speed until well-blended. Stir in 1 cup chocolate chips. Drop batter by heaping Tablespoonfuls 2 inches apart onto baking sheets coated with cooking spray or on a silicone baking sheet. Bake at 350 for 18 minutes or until golden. Cool on pans 2 minutes. Remove cookies from pans; cool completely on wire racks. These are disappearing fast over here. Yum yum…look so good Cathy. Love how u walked us through it…simple & special cookies! These cookies are a delight to look at….is that your new garden in the background…looks so lovely and sunny!!! Yum. This looks fantastic. I am going to make these for my girls. Thanks again for another incredible recipe. What would I do without you in my life? My family wouldn’t be as happy as much as you inspire me in cooking. I love the idea of banana inside the cookies! How delicious! Ooh my family would go for these! Now if I can only keep bananas around long enough to get super ripe. I’m always looking for lower butter cookies, this is one I will definitely be trying! Perfect! I have a few bananas that are past their prime! This would be the perfect thing to make with them! I think I would like them without the chocolate chips. I don’t like chocolate chip cookies, but I love cookies. Love the addition of bananas in this cookie. I prefer a soft cookie so this looks perfect. Yum. Those cookies look delicious. I am allergic to chocolate, so how do you think Butterscotch chips would do? It might taste like Bananas Foster, my ultimate favorite dessert!! I would say they are a lot healthier than most desserts. I think they would be perfect. The bananas do not even have to be super ripe…mine was medium ripe, no brown skin, just soft. Those look yummy! I love banana and chocolate together. This is my kind of healthfood! I’ve never tried bananas with oatmeal…but why not? And who doesn’t like banana and chocolate? I am drooling. Since they have banana in them, these are definitely a breakfast food right? They would be gone quickly in our house too – they look great. Great idea adding bananas into the mix! I love this! I would so eat these for breakfast!!! I love that you’re taking all your food pictures in your back yard these days. That will be hard once the rain starts! mmmâ€¦i really like how brown these got! honestly, i do doubt youâ€™ll ever find a recipe for a cookie containing chocolate and oats that isnâ€™t edible, nay, delicious. I’ve never ever added bananas to cookies. I can’t wait to make them! Add a little peanut butter, and you’ve hit all the nails on the head! I’d say those qualify as health food of the yummiest kind. Look good! Do you use De Marle bakeware? I’m totally in love with it! I think anything with oats = healthy! Do you use your silpats very often? I’ve been thinking of getting them since my cookie sheets are getting kind of old – your thoughts? They sure look healthy to me and delicious. I will need to try these for my oldest daughter. She loves banana bread and chocolate chip cookies, so these may kill two cravings in one package. Nice cookies, love the this version…yummie. By the way, nice pictures! Wow! That looks so yummy!! Awesome pictures too, thanks for the recipe! These do look super moist! I love anything banana/chocolate! This is my kind of cookie!! Love this combination and they look so moist and yummy!! No way I could stop at just “10”! Cathy, I make a version of these that is my “go-to” must take along cookies recipe…with or without the ‘naners they are super tasty! Crap, my girlfriend just threw out an overripe banana because we didn’t have enough for banana bread! Next time. Love how these sound, I do, also love the suggestion of the duo dishes, some pb. Hmmm, I have bananas ready for this. Thanks. I have all the makings for these puppies! Yum city. A cooking light recipe with bananas and oatmeal? It’s gotta be a health food! Looks healthy and quite tasty! love your site! great photos and recipes. 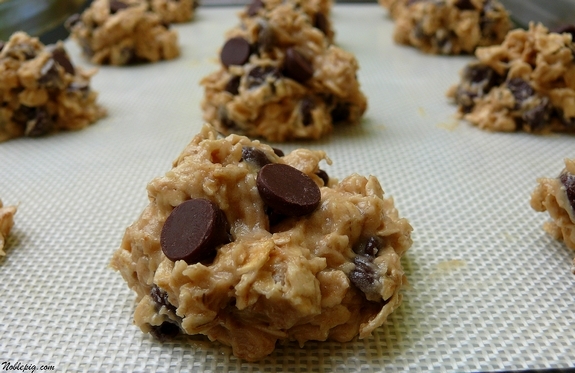 My 3 1/2 year old loves banana’s and loves cookies…hmmmm…I might have to try these! 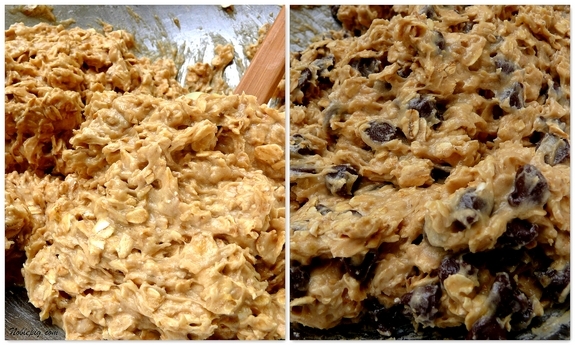 I usually like baking chocolate chip cookies more than eating them, but this sounds like one I’d be eating! YUM!!! 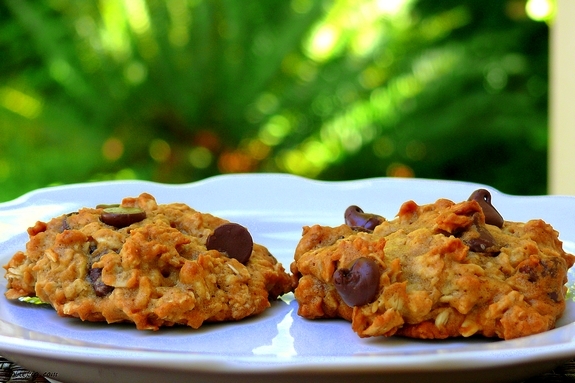 These really are quite healthy–whole wheat pastry flour would make them perfect for my family. Way better than many “breakfast candy” cereals/bars/toaster pastries, if you ask me. Those look delicious and much healthier with the banana and not so much butter. I love the colour on these! I share your mission — I’ve never met a variation on the chocolate chip theme that I didn’t love, except for peanut butter cookies. Love chips and oatmeal together. I love all things banana and those cookies have the deadly combo of chocolate and banana!!!! Love it! Am making these RIGHT NOW. Except I’m using milk chocolate chips instead of semi-sweet. I can’t wait to pop them in the oven and inhale the wonderful smells that I KNOW are awaiting me. What a fun idea, and inspiring. Sort of summery, almost tropical. It makes me think of other flavors I might want to add too. oh, yum. 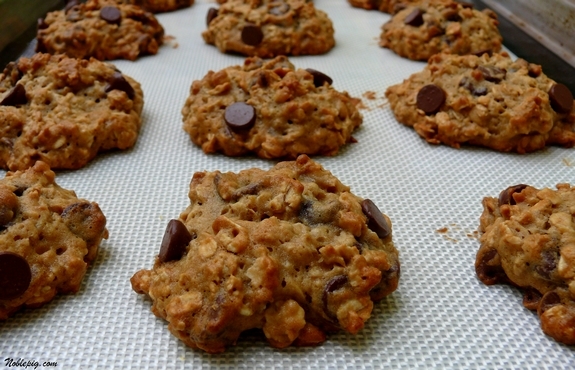 I keep a bag full of ripe bananas in the freezer for baking, and I’m so making these cookies. I love your blog, and just added to you mine if you don’t mind . hmmm.. yummy.. I’ll have to try these. They are almost like the cookies that my grandmother used to make when I was a kid, but sans the banana. You must have missed the memo – banana and oatmeal negate butter and chocolate. WOW! Wish I had been on the golf course with those guys, I would have eaten every version of these cookies too! I am a cookie fanatic! I can turn down a piece of cake or pie at times, but NEVER a cookie! The addition of banana sounds fantastic!! Love everything about this! Great flavours! Just made these and they are disappearing fast around here too. 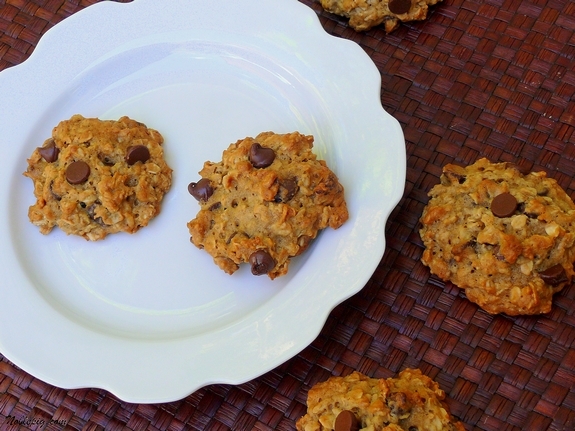 I added some chopped walnuts so now they taste like a banana loaf cookie but with more fiber. The banana does three things, cuts down on butter needed, adds a nice flavor and adds moisture. Hello, this is a silly question. Approximately how many cookies does this recipe make? Hi again, I’m sorry. I’m full of stupid questions. (I’m actually quite new at this cooking/baking/etc. thing.) Should you freeze or refrigerate these cookies prior to putting them in the oven? I’ll be making these for sure. Set your own life time more easy get the home loans and everything you want. I’d love to see comments on how these turned out! Everyone says they will make them, but no one says the results! I made these yesterday, and they were excellent! They turned out very soft. My neighbors want me to make them another dozen! I just wanted to praise these cookies back here where I found them. Have made them a couple times now and they are the best cookies ever! For anyone interested they are good with raisins too, and I’ve found that quick oats work better than whole rolled oats.